UFO SIGHTINGS DAILY: UFO shoots away from Earth causing giant beam of light behind it. April 2016, Video, UFO Sighting News. UFO shoots away from Earth causing giant beam of light behind it. 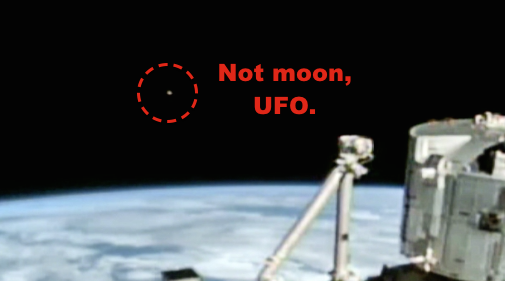 April 2016, Video, UFO Sighting News. Now this is a bit confusing. Is that a UFO leaving earth...maybe, we see its leaving because if you add light to it, the beam gets thinner the farther away it is. Also a UFO is seen, but its to small to be the earth, may possibly be Jupiter, since its very visible in the night sky right now. Hard call. That light however...its thickness its incredible. Covering a width of hundreds of miles. It must have come from the ocean, and left so fast it left a visible trail for a few seconds. Then...it could have been a wormhole, a long tunnel to transport someone or something a far distance. We see the tunnel made then disappear. Nothing to worry about, just time traveling aliens. 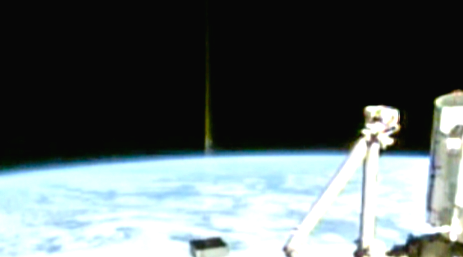 During an ISS live NASA UStream, an orb-like object appeared just above the horizon. After remaining in the same relative position for awhile it began to ascend up and out of the UStream camera lens coverage area. Once it left the screen an energy beam shot up from the earth toward the UFO's former location. Gauging by the distance between the ISS and the location of the energy beam, the relative size of the UFO must have been enormous. 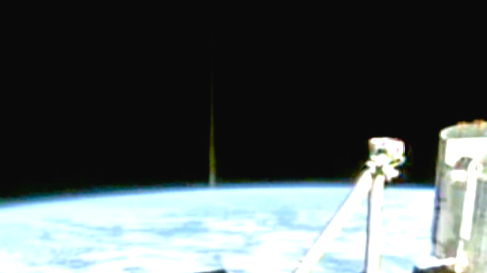 I am hoping that someone with technical background can determine the location from where the beam was fired based on the time of the siting (7:25 p.m. Central European Time) and the ISS live feed metering that is displayed at the bottom left of the frames in the video. The video is comprised of multiple screenshots I took during the siting.